Every Fridays, the PAOLO BLAQUERA JAZZ TRIO(Paolo Blaquera-Guitars, Jonathan Co(JoCo)-Drums, and Empi Martinez(Session)-Bass) plays here. We've also had Miss Zenaida Celdran, one of the prime movers of the PI JAZZ. We only allow an ACOUSTIC SET, as we cannot Have a FULL ELECTRIC band cuz of Soundproofing and Neighborly concerns...So we play it stripped down, soft, and intimate here. On the 29th of March, SKARLET and Mr. Noli Aurillo will be playing here...So I'm Inviting everyone to come and see these great Jazz Legends FOR FREE!!! We don't ask for entrance fees whatsoever....I don't believe in that!!! Jazz...and Music in general should be EXPRESSED, PLAYED, SEEN and HEARD for free! We recently opened last November...and has been catering to different people from all walks of life. We're hoping you could come and experience this whole myriad of taste and music one of these days!!! Congratulations, and all the best to your jazz-club. I've heard alot about this place! looking forward to dropping by soon! Nice. I really really owe the Paolo Blaquera Jazz Trio a visit. hahaha. Had a great time with Paolo, Empi, JoCo and the other peeps last night at Tago bar. Nice and cozy place for jazz buffs like me. Very accessible too, just a few paces away from Edsa-Main intersection. Next time, jam. Hi bea! was suprised to see "med student" beside "bassist" and "jazzfan"....im a guitarist, (trying to be a jazz guitarist)i graduated from med school in 2010, passed the boards last year..havent started residency coz my band and I are recording our album! music and medicine...unlikely combination haha wish there were more peeps like us in our community...tired of the "bieber" and "rhianna" people if u know what I mean..cheers to med and jazz! 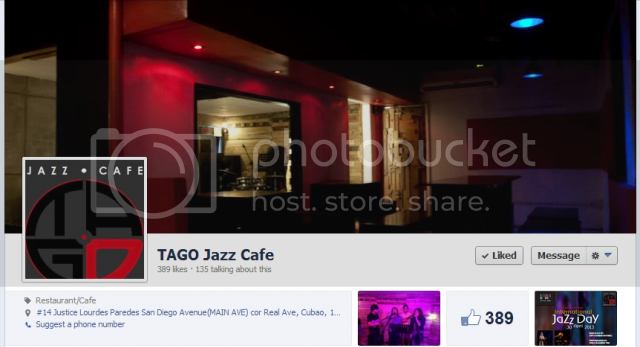 Tago Jazz Cafe is back!!! A place for friendship, good food and good music. 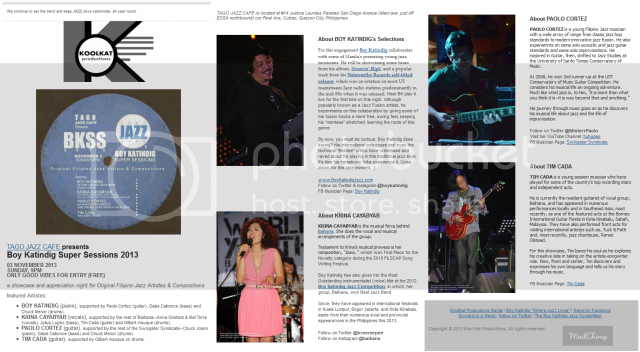 Original Filipino Jazz Artists and Compositions. This Sunday, October 27 9pm. A pilot event to feature young & upcoming jazz artists and to bring out those original pinoy jazz compositions. Jazz on! Boy Katindig Super Sessions is move to November 3. Election liquor ban, sucky stuff. Will post on this thread for major events from Tago Jazz Cafe. I heard it's a nice place...we'll check it out soon..thanks! Hi! Do you allow minors at your cafe? My 12-yr old son has found a liking to jazz music lately (without my prodding.. i'm a metalhead ) so I'm scouting for a place where I can take him and hopefully deepen his appreciation for the music. Of course. Tago's ambiance and atmosphere caters to all ages, race, generation and music preference. Take time to check out the featured artist at their FB account. So I'm Inviting everyone to come and see these great Jazz Legends FOR FREE!!! We don't ask for entrance fees whatsoever....I don't believe in that!!! Jazz...and Music in general should be EXPRESSED, PLAYED, SEEN and HEARD for free! We are lucky, proud and blessed to have someone of this guy's caliber to visit and share his wisdom & music with us. International Jazz day in Tago!! Bad Behavior has blocked 83348 access attempts in the last 7 days.